Working closely with the Lakes International Comics Art Festival, the Comics Laureate champions the role of comics in improving literacy through a programme of educational visits, workshop events, guest appearances and conferences. A key focus will be working to increase the acceptance of comics as a creative artform in schools, libraries and throughout the education system. 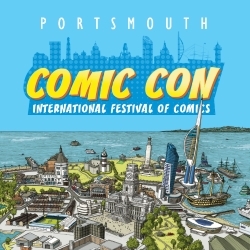 Hannah Berry, who takes over the role from Walking Dead artist Charlie Adlard, is an award-winning graphic novelist, comics creator, writer, illustrator and editorial gun-for-hire. In 2018 she was inducted as a fellow of the Royal Society of Literature and became the slightly grander ‘Hannah Berry FRSL’. Her first graphic novel Britten & Brülightly, begun while studying illustration at the University of Brighton, was published by Jonathan Cape in 2008. It has subsequently been published in the USA, Italy, Holland, France and Serbia, with the French edition chosen for the official selection of the 2010 Angoulême International Comics Festival. Her second graphic novel, Adamtine, was published in 2012 and her third, Livestock, in 2017, both by Jonathan Cape and both to a pleasing amount of critical acclaim. Livestock was nominated in the Best Graphic Novel and Best Writer categories at the 2017 Broken Frontier Awards, winning the Best Writer Award. She currently does a monthly cartoon strip for Prospect magazine and formerly did a weekly cartoon for the New Statesman. She has contributed to several comics publications internationally, including 2000AD (Rebellion), and wrote the Sentinels reboot as part of the 2017 Scream & Misty special published by Rebellion. A regular guest of art, literature and comics festivals in the UK and around the world, her artwork has been exhibited in solo and collective exhibitions worldwide. Around the comicking, Hannah co-hosted the No YOU Hang Up podcast (currently on hiatus due to work and family commitments) with Dan Berry: a very relaxed interview programme of sorts with creative guests and silly chitchat. She is an occasional tutor for the Arvon Foundation and was the 2012 Online Writer in Residence for Booktrust. “Comics are the perfect gateway drug to literacy – warm and inviting yet often surprising and challenging: the artful union of universal pictorial language and the written word,” says Hannah of the medium. “I gained my love of language as a child through reading comics, and I look forward to inviting new audiences to discover comics for themselves. The Lakes International Comic Art Festival ran from 11 to 13 October this year and will be back next October.